When it’s done well, historical fiction transports you to a particular time, place and setting through the eyes of its characters. The best historical fiction makes me want to learn more about the period or the characters. I try to refrain from googling while reading a book but if I’m itching to look something up, I know the author succeeded in transporting me to another time. That’s one of my favorite genres. Two compelling novels came out recently which center around independent and unconventional women, one real and one fictional. Learning to See focuses on Dorothea Lange and her photography in the 1930s. I’m familiar with Dorothea Lange’s Dust Bowl photographs but not much else. In this thoroughly researched novel, author Elise Hooper brings readers into Lange’s world. Told from Lange’s point-of-view, the novel follows her burgeoning career as a photographer at a time when women weren’t pursuing careers, they were focusing on raising children. After moving to San Francisco with a friend, Lange finds work at a photography shop. She soon opens her own portrait studio and amasses clients. She’s friends with a group of photographers and artists which includes Ansel Adams. She marries rather volatile artist Maynard Dixon. They travel to Arizona so that Dixon can work on some painting. Lange notes: “Our first few days were spent examining the terrain, so different from everything I’d ever known: wide sweeps of empty desert, soaring sky, endless clouds. It felt timeless, nothing like the city. The simple geometry of the landscape’s lines and bold shouts of color left me awed. During each sunrise and sunset, under a sky bruised with purples and rippling with flames, the desert was reborn. The air thrummed with possibility.” Lange is an independent, strong woman determined to use her skills to benefit others in a deeper manner than merely taking pretty portraits. Navigating her way as a working mother, wife and professional photographer, Lange faces many challenges including her husband’s alcoholism and affairs. When her marriage and the nation’s economy begin to decline, she decides to take a position with the government taking pictures of the country’s disenfranchised, the photographs she’s known for today. She photographs migrant workers and Japanese Americans in camps during World War II. Hooper effectively allows readers the opportunity to see the time period through Lange’s lens. This wasn’t on my radar but the title and cover intrigued me so I started reading it one day and became completely absorbed by it. After immigrating to the United States from Ireland, three siblings forge their path in antebellum Cincinnati in The Eulogist. James establishes a successful candle-making business, free spirit Erasmus becomes a traveling preacher and independent, open-minded Olivia challenges a conventional life. These dissimilar siblings function like the id (Erasmus), ego (Olivia) and superego (James). I became completely charmed by Olivia, by her loyalty, curiosity and determination. She attends lectures by feminists and abolitionists and questions women’s expected roles during that time: “That summer of 1829, culture and curiosity came over the city like the quickening of a maiden’s heart. Cincinnati was overrun by fanatics and intellectuals trying to make their case: Caldwell’s discourse on phrenology; Miss Fanny Wright on slavery and marriage; Dr. Alexander Campbell and Robert Owen battling the fundamental relationship between godliness and goodliness.” She’s not particularly interested in marriage [“I have never been one to pine for marriage, nor did motherhood enchant me. As I saw it, marriage was a function of economic dependence, and wrongly, too, since women rarely had money of their own.”] or starting a family. She does end up marrying a doctor who she falls in love with after spending time with him performing autopsies and doing research on corpses. When he dies, Olivia returns with his body to Kentucky to find her brother-in-law heavily involved in slavery. She’s determined to save a young black woman who has been living fairly free in Ohio from being returned as her brother-in-law’s property. She enlists the assistance of both her brothers. Through detailed descriptions and strong character development, I found myself completely engrossed. Taking place in the decades preceding the Civil War, slavery was illegal in Ohio, the first state created from the Northwest Ordinance of 1787. Ohio was active in the Underground Railroad. I recently found a family tree my grandmother created which traces several generations in Ohio and I’d like to conduct research someday to see if any of my ancestors had any involvement in the Underground Railroad. The perils of being a free-spirited, intellectually curious woman during the Civil War are at the heart of this historical fiction novel, based on an event in the life of Henry James. After being expelled from boarding school for her improperly close friendship with a schoolmate, Augusta, and being accused of not fitting in, Emily Hudson finds herself at the mercy of her mother’s brother in Newport. Emily lost her entire family to consumption and her uncle feels overly burdened by having her in his care. He’d like her married off as soon as possible but Emily has other ideas. She wants to travel. She wants to be an artist. She plays piano and sketches and paints when she can. While her other cousins are off at war, William, who’s rather weak and sickly, remains behind in Newport. Soon Emily and William spend their days talking about literature and travel and have become the closest allies. When a relationship falls through for Emily, William decides to take her abroad under his guardianship. Emily had longed to visit England and be part of European society and away from her puritanical uncle but she soon finds that William is as controlling. If Emily is every going to be free and truly content, she must make her own plans. I wish you would not describe me and pinpoint me so continually. Besides, in my belief, a person is always essentially themselves. That cannot be changed or altered. Author Melissa Jones has created a rousing feminist character in Emily. She’s outspoken and likely to shun conventionality. Emily’s a bit ahead of her time. Women are supposed to be married off by a certain age and then be relegated to the kitchen and drawing room, only to come out for parties and entertaining. And to be an artist at this time? It’s rather unusual and Emily certainly meets those who doubt her talents and capability to make it out there on her own, including her dear cousin William. Throughout her elegant prose, Jones makes it quite clear that William suffers an awful jealousy of his cousin’s fiery persona and independent nature. He tries to control her through an allowance but Emily refuses to be constricted by proper society and her cousin’s simplistic wishes for her. Above all she was tired of fighting and struggling, struggling with her own nature—her own being. Outstanding research and scintillating physical descriptions makes Emily Hudson a truly stand-out work of historical fiction. Through memorable settings and eloquent details, Jones turns 18th century Boston and British society into beguiling additional characters. 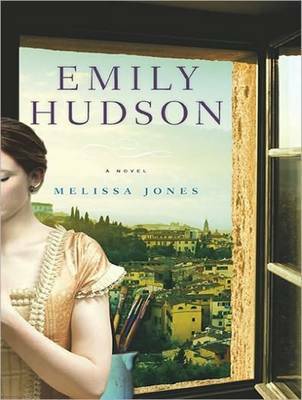 Emily Hudson is a charming story about one woman’s search for her true self and everlasting happiness without sacrificing her ideals.